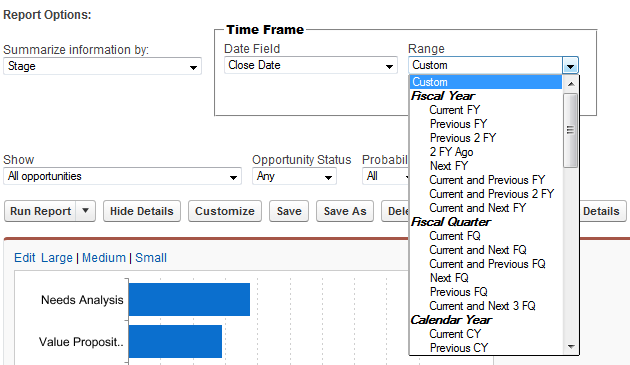 In Salesforce, when we run a report, there is a Time Frame option predefined and available for us to use, see below list. But it will not have ALL date range as we want. Use Case 1: get all opportunities with Close Date = Last 3 months, example: now = 11 Dec 2014. So, we would like to show all opportunities close date from 1 Sep 2014 – 30 Nov 2014. With above available Time Frame option, we do not have option to filter by Last 3 Months. Use Case 2: get all opportunities with Close Date = Year-to-date (YTD), as of Wikipedia, YTD = Year-to-date is a period, starting from the beginning of the current year, and continuing up to the present day. With above available Time Frame option, we do not have option to filter by YTD.